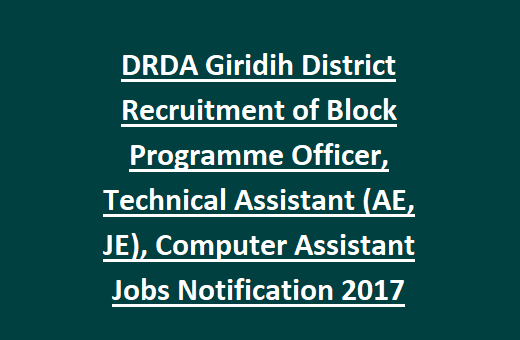 DRDA Giridih Technical Assistant (AE/ JE) jobs Recruitment 2017: District Rural Development Agency, Giridih welcomes candidates for the vacancies of Block Programme Officer, Technical Assistant (Assistant Engineer, Junior Engineer), Computer Assistant, Account Assistant jobs. The total vacancies available in DRDA Recruitment are 59 posts. Candidates having specified qualifications, other eligible criteria can apply for these vacancies using the official website of DRDA Giridih @ http://www.giridih.nic.in. Application submission last date is 19-August-2017. Dead line for sending hard copy of DRDA application to addressed to District Rural Development Agency DRDA, Giridih on or before 26-August-2017. Application fee for UR category is Rs. 200/- and Rs. 100/- for OBC category candidates. Candidates of PH, ST, SC category application fee is Rs. 50/-. Selection of individual for these Technical Assistant (AE, JE), Computer Assistant jobs in Giridih DRDA Recruitment is depends on written exam and interview. Complete details of Educational information, age details, selection method, pay scale of District Rural Development Agency DRDA Technical Assistant (AE, JE), Block Programme Officer, Computer Assistant jobs are given below. Last date for DRDA application submission: 19-08-2017. Last date for sending DRDA hard copy of application: 26-08-2017. Total available posts: 59 posts. - Block Programme Officer: 12 posts. - Technical Assistant (Assistant Engineer): 13 posts. - Technical Assistant (Junior Engineer): 25 posts. - Computer Assistant: 05 posts. - Account Assistant: 04 posts. For Block Program Officer must have completed Degree with 55% or Post Graduation. For Computer Assistant Jobs-B.Sc Computers/BCA or MCA/M.Sc Computers of B.E/B.Tech CS/IT. Additional Qualifications:B.tech/ BE/ BCA/ B.Sc Computers/ BSc computer Honours/ MCA/ MSc Computers/ M. Com from recognized university. Please see the DRDA Notification for more qualifications. Age of the applicant should be 18 years to 35 years as on 31-May-2017. For age relaxations see the DRDA Notification. Candidates will be shortlisted based on written examination and Personal Interview. 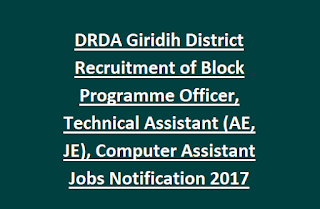 Applicants who are interested for these Giridih DRDA Recruitment vacancies are advised to go through DRDA website http://giridih.nic.in. After submission of application send the hard copy of DRDA Giridih application to the address mentioned below is 26-August-2017.